Without a doubt, they are among the best of their generation and are regularly nominated for the blues world's highest honors. After two years, Groove Now is once again able to present its own project - The Blues Giants. The former Trampled Under Foot guitarist, Nick Schnebelen, will substitute for Mike Zito. 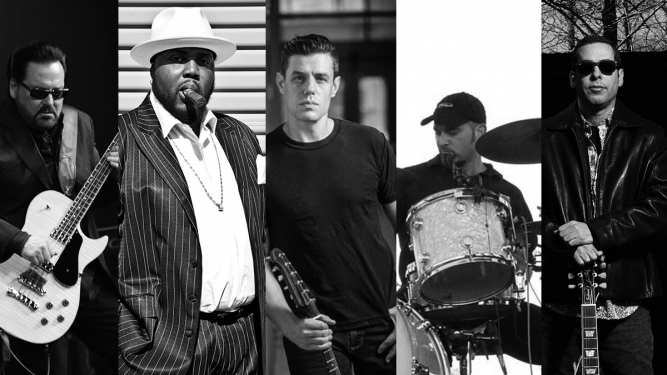 The rest of the band members will be the same - the one and only, singer and breathtaking performer, Sugaray Rayford; Fort Lauderdale guitarist, Albert Castiglia; and former Mannish Boys? rhythm section, Willie J. Campbell and Jimi Bott. In 2017, The Blues Giants were the sensation of the year. Now they are coming back to Switzerland for two surely unforgettable performances - exclusively at Groove Now. The audience will be treated to another double dose of blues and soul standards performed by some of the very best contemporary artists in modern blues. A thrilling show full of surprises is guaranteed!